Agent Wexler is new on the job, her aim at the range may not always be accurate, but she has confidence aplenty in her job as an FBI agent taking down the bad guys. Starting out her new career busting an internet perp who was harassing a woman online from New York, she soon is pulled to a crime so complex it’ll have them running in circles trying to find out who-dun-it. Up and down Seattle, Nora Wexler and her partner, the handsome war vet Travis Greer, will try to solve the future crime and murder of a lovely unassuming Seattle business owner. Every twist and turn of this story will keep the agents and readers guessing as more and more victims and suspects are pulled into the plot. Novels that show a great complexity and depth like this one keep the reader on their toes. 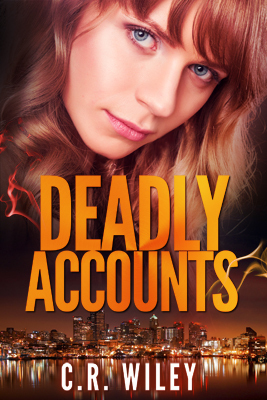 True to the thriller genre, Deadly Accounts dishes up tension throughout every scene, and C.R. Wiley raises the stakes like a pro. Wiley gives us just enough characters to follow and a level of plot with enough subplots to throw us off the track while at the same time keeping us invested in the characters. I thought it was an interesting technique to switch perspectives almost every chapter between the main character Nora Wexler and her partner agent Travis Greer, which allowed the story to open up in ways that sticking to one voice wouldn’t have. Travis gives us the seasoned agent’s perspective while Nora gives us the agent who has to prove herself and rise above the FBI’s glass ceiling. Nora is still the main character and I’m glad the story focused on her because she is an exhaustingly amazing character to follow. She is confident, but not egotistical. She doesn’t fall into the traps of a woman in a position of power. She is sturdy and strong and is able to pull out bravery and gumption when needed without jumping – too much – headlong into danger. She is a rookie after all, so everything can’t always go right for her, which is what makes for the great story. “You might think it wouldn’t , but you’d be wrong,” she said. “That’s the difference between you and me. If you make a mistake, you’re just having a bad day. If I make a mistake, suddenly there’s something wrong with my judgment and I can’t be trusted to make rational decisions. That’s part of the reason why women only make up twenty percent of FBI agents. I always knew it would be difficult to get in and get some respect for myself, but I didn’t think I’d blow it this early.” (Page 126). Nora doesn’t let this fact get to her, or the fact that if she makes a mistake, she’ll be pulled back to a desk job and off the front line. A good thriller is one that presents a plausible situation today and C.R. Wiley delivers. The perp in the book utilizes cyber technology to hack into people’s identities and to maneuver silently around the city. The agents must use their own skills against him and the way they do is so clever. In today’s world identity theft is a real threat and to pair that with murder makes for a downright scary situation. If the theif and murderer isn’t caught while the case is hot and the potential victim is still alive, he will disappear forever through the lives and identities of anyone. Wiley brings this fact up again and again to raise the stakes and create an exciting must-read novel that I would recommend to anyone who likes thrillers with a bit of mystery and murder that feature an up and coming female FBI agent. This novel was published through CreateSpace Independent Publishing Platform 07/14/2014 and is available on Amazon here.